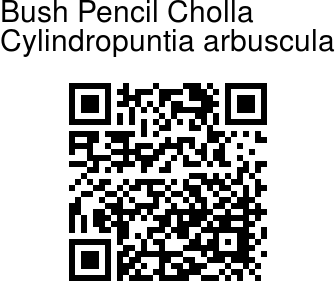 Bush Pencil Cholla is an interesting cactus native to Arizona, in the American continent. It has small flowers; flowers may be chartreuse, pale reddish-orange, or mixtures with bronze. Inner tepals are green- or orange-bronze, spoon-shaped, 1.7-2.0 cm, apiculate; filaments dark green-bronze; anthers yellow; style whitish basally to light orange apically; stigma lobes very pale green. 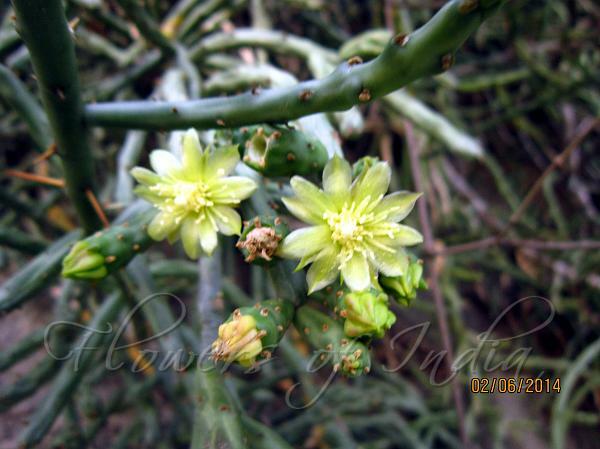 Stems are light green in color and very thin, usually no wider than 1.5 cm. Spines are yellow-brown in color, up to 1.5 inches long and point downwards; there are between 0 and 3 per areole. The lack of spines on some areoles is an identifying feature. Mature plants reach heights of 4 feet, with hundreds of branches 2-5 inches long, sprouting from an upright trunk.